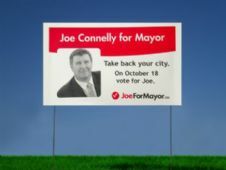 When Joe Connelly campaigned hard to win his seat on the city council, like most people running for office, he spent a considerable amount of his election funds on signage that was displayed throughout his ward. He says that producing 2,000 or more signs is a minimum for most and, post-election, they end up in the landfill. After three years serving as an alderman, he decided to seek the mayor’s chair and charged one of his volunteer workers with the task of finding signs that could be recycled. No joy here, but a manufacturer was found in the U.S. who could print them on a recycled paper product that was still competitive, even with the cost of shipping and border fees. Connelly didn’t make mayor, but has pursued the “green” idea and, after completing negotiations with the U.S. firm, has become its Canadian partner to sell its product here, and launched Green Signs: Mother Nature’s Company here in Calgary. He says although some local signs are advertised as “green” because they use vegetable inks, they are made of plastic-coated cardboard and have to be disposed of in the landfill. His new patent-protected product is made of coated paper, similar to that of a milk carton, which can be tossed into a blue bin. Connelly has already been talking to a number of would-be provincial politicians and expects that he will be able to persuade many – who realize they must be environmentally conscious – to use Green Signs and be able “to brag about being green” during their election campaigns. It’s a big job to get the product launched in such short a time, but Connelly is no stranger to marketing or hard work. A former senior marketing/project development manager with Telus, he championed its largest marketing event with the province wide torch relay in support of 1995 Canada Winter Games. And he reintroduced the Learn To Ski program into both Catholic and Calgary school boards, thereby affording thousands of young students the opportunity to ski. In 2000 he became director of sales and marketing of Resorts of the Canadian Rockies and joined Tourism Calgary in 2003 in the role of vice-president of sales and marketing. There he assisted in establishing the very successful Calgary Sports Tourism Authority that has hosted so many revenue generating events. Jumping into civic politics, he defeated the incumbent in Ward 6 but had to give up his aldermanic seat when he decided to run for mayor. This next little while he will focus on helping to get others elected with his new signs, but also will be sowing a few green seeds for other applications within the real estate, construction and retail industries – and they would be perfect for the advertising signage that meets you at every hole of a golf tournament. Connelly already has a salesperson based in Edmonton and a partner in Ontario to cover the eastern half of this country. Meanwhile he is still a big booster for Calgary, with a passion for sports and tourism, who volunteered at the 2012 World Juniors, Sledge Hockey, and sits on the board of the Calgary Dragon Boat Society. Laurel Edwards, managing director, valuation and advisory services of Colliers International, is the new president of the Calgary chapter of NAIOP. Joining her as new board members are Trevor Sawatsky of GWL Realty Advisors, and Greg Walter, of Fraser Milner Casgrain. Her first event as this year’s president will be a breakfast on Jan. 25 at the Hyatt Regency Hotel when Todd Hirsch, senior economist with ATB Financial, will discuss Alberta’s economy in 2012. Kung Hei Fat Choi/ Gong Xi Fa Cai to all of our friends in the Chinese community who play such an important role in the life of this city. Many will join with them in celebrating the Year of the Dragon, symbol of good fortune and master of authority.